"The Hottest Fly Rod Fish in the East"
I have been a fly fisherman for 27 years and for many of those years, I fished exclusively for trout. In the spring and fall I would explore the Class A, wild trout streams of Pennsylvania and in the summer I would travel to Montana, concentrating my efforts on many of the most productive "blue ribbon" trout fisheries in North America. Like many fly fishermen I was only interested in pursuing wild trout and never gave another species a second thought. However, in the last 10 years, I’ve been investigating fly-fishing opportunities for warm water and saltwater species, beyond trout. During that time the fastest, strongest and hottest fish I’ve experienced has been Euthynnus alleteratus, false albacore. 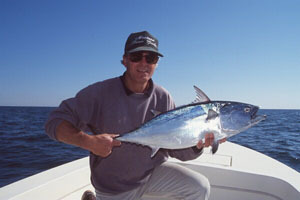 False albacore, fat alberts, little tunny or albies are tuna type fish, members of the mackerel family. Albies have dark wavy lines on their blue-green backs, silver blue sides, silver white bellies, large eyes and no perceptible teeth. These fish are built for speed with torpedo shaped bodies, smooth skin, retractable dorsal fins and high-speed tails. They possess power and stamina and have all the attributes of larger gamefish. Little tunny have little food value and should not be confused with the long finned albacore, Thunnus alalunga, used in canned tuna. Floridians mistakenly call little tunny, bonito. 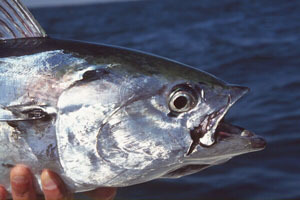 However, Atlantic bonito, Sarda sarda, are another species of the mackerel family with fine teeth. Albies are schooling fish but they also spread out and feed separately. 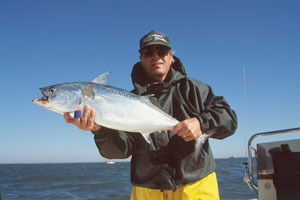 The fish will feed in strong rips, near harbor mouths, saltwater inlets and will also chase bait along the beach. They prefer shorelines near deep water, but will not tolerate sandy or fresh water. (2) Often albies feed in a predictable pattern, surfacing in one location and then in a second and a third. After a time, the fish will return to the first location and repeat the process again. 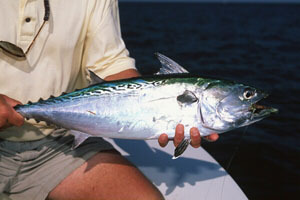 False albacore will feed throughout the day, but are most active on a moving tide. There are several ways to catch fat alberts, but the most exciting is to "Chase Breaking Fish." At times, albies tend to congregate in small schools or pods when herding baitfish. Therefore the idea is to sit in a boat at a promising location, wait, watch and spot breaking fish. 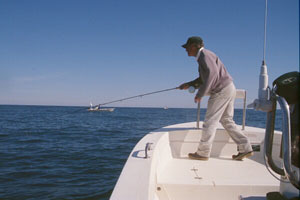 This strategy works best with two persons on board, one to maneuver the boat and the other prepared to cast. At the appropriate time, one quickly fires up the boat and runs to the side of the school. Here the fisherman must be ready to cast quickly and accurately (distance is not as important) as the fish strike fast when chasing bait. Presentation is most important and one must put the fly into or in front of the feeding fish and begin stripping the line right away. Determining how the fly should be moved through the water is always part of the game, and one must vary the movement, from slow to fast, short erratic or long steady strips, until one finds the technique, which appeals to the fish. Personally, I have found a slower medium strip to be the most effective method. Chasing breaking albies is great fun, but it can also be frustrating, because many times the fish are gone when you reach a destination. A second strategy is "Chumming", to attract a school of fish and keep them close to your boat. Throwing cut bait and/or live minnows into the water will often bring fish. Once the fish are close, casting flies, which resemble the "chum", is an effective technique. Using small thin-bodied Clousers to mimic the live minnows and larger fuller bodied flies to resemble pieces of cut bait have resulted in numerous hook ups. At times when fish are close to the boat and actively searching for food, one can cast poppers and catch fish on the surface. Often when several boats are working together, chumming as a team is productive in open water. 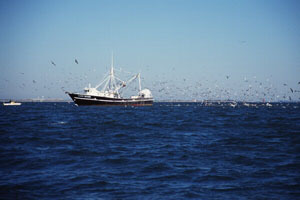 Finally a third way to catch false albacore is to "Follow the Shrimp Boats." After the shrimp boats have trawled through an area, they haul in the nets, remove unwanted fish and dump the by catch back into the water. This operation effectively creates a chum line and the albies are often feeding in that line. Sometimes the alberts are remarkably close to the boat, where the by catch is being dumped and other times the fish are further back in the wash. Here one must follow the shrimp boats, coming close to where the by catch is being dumped, cut the engine and begin casting into the chum line. One should continue casting into the wash even as the shrimp boat pulls away. At times the albies will be an eighth of a mile or more in back of the boat. Not every shrimp boat will have albies eating the by catch, so one must search from boat to boat. 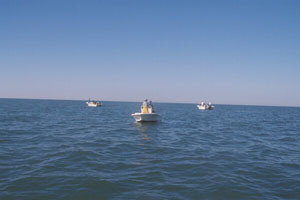 Often a shrimp boat coming out of deeper water into shallow water will be a good choice to follow. Alberts take a fly hard, often as they turn and are easy to hook. The fly line will tighten quickly and in a matter of moments they can strip all the fly line off the reel (200 yards of 20-30 lb. braided Dacron backing is the norm). After a long initial run the fish like to double back. Often, albies will dive deep after several long runs. These fish are determined, extremely fast and superb fight0ers. 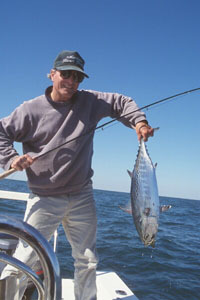 A large arbor reel with a good disc drag is recommended equipment to fish for false albacore. One should use 9 ft., 8 wgt. graphite rods for little tunny 5-7 lbs., but 9-10 wgt. rods are more appropriate for fish larger than 10 lbs. Generally, I prefer using Cortland 325 grain and Teeney 450-grain sink tip lines, but I switch to intermediate lines when the fish are consistently on the surface. Relatively small flies (2" to 3"), sizes #2, #4 to #1/0, designed to imitate silversides and small baitfish work best. Ultrahair Clouser deep minnows in dark green over gray, light brown over yellow and green over yellow have all been productive patterns. False albacore are simply the hottest fly rod fish in the east and if one has the opportunity to catch these fish I’m sure they will not be disappointed. Two of my favorite areas to fish for little tunny include the Outer Banks, NC from September through mid November and off the coast of Palm Beach, FL in early June. Greg Mentzer is a licensed outfitter/guide operating Montana River Guides in Craig, Montana. He has been guiding fly fishermen for trout on the Missouri River since 1985. (1) Ed Mitchell, Fly Rodding the Coast, (Stackpole Books, 1995), p. 239. (2) Lou Tabory, Inshore Fly Fishing, (Lyons and Burford Publishers, 1992), p. 144.